The Genesis Flood (also called the Noachian Flood, among others) radically changed the earth's surface and send secular geologists on a goat rodeo to try and force-fit the observed data into their paradigm. Doesn't work too well. Creationary models explain data far better, as we have seen numerous times. What about Noah himself and the massive project? Scoffers argue from ignorance and incredulity based on their naturalistic presuppositions, saying that the Flood was fictitious, such as this bigot. There are no miracles — because atheism. They refuse to even consider the possibilities of Noah doing his work, preferring prejudicial conjecture to learning our side of the story. Two reasons scoffers hate recent creation is because Darwinism needs long ages, and it shows that God is our Creator. They also hate the Flood because not only does geology support creationary models, but Noah's Ark is a type (foreshadowing) of Christ. Evolutionary presuppositions dictate that ancient man had not evolved a great deal of intelligence, which has been refuted by the skills of say, the Neanderthals and the dudes formerly known as Cro-Magnon. Noah and the people of his time, and afterward, were not the semi-sapient brutes that evolutionists would have us imagine. Yes, the Flood was a miraculous event. However, it had natural effects that are studied. Otherwise, God could have simply lifted up Noah, his family, and animals, flooded the world, and then set them back down without having to deal with Ark building. Don't disunderstand me, there's nothing wrong with asking honest questions. We have reasonable, biblical speculations and inferences. For instance, who can reasonably say that Noah did not hire local labor? They didn't have to agree with his views (I do not agree with the views of my own employer, but I work anyway). There are several other items worth considering. Intelligent people, with God's help, were able to make things work. And it was work. Obviously, it wasn't a pleasure cruise! Fantastic Voyage: What Did the Ark Look Like? 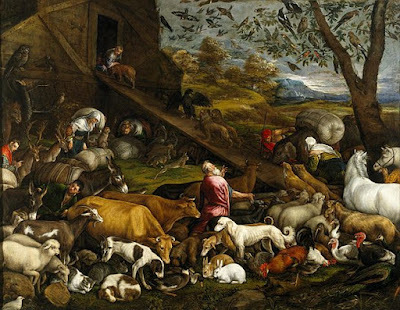 Fantastic Voyage: How Could Noah Care for the Animals?